Last year I made a statement about MotoGP. I said that the MotoGP series had a problem. It had stagnated as a series and wasn’t making any real noticeable improvements. From the visuals to the gameplay, it just felt like the series was stuck in the mud, turning its wheels but going nowhere. 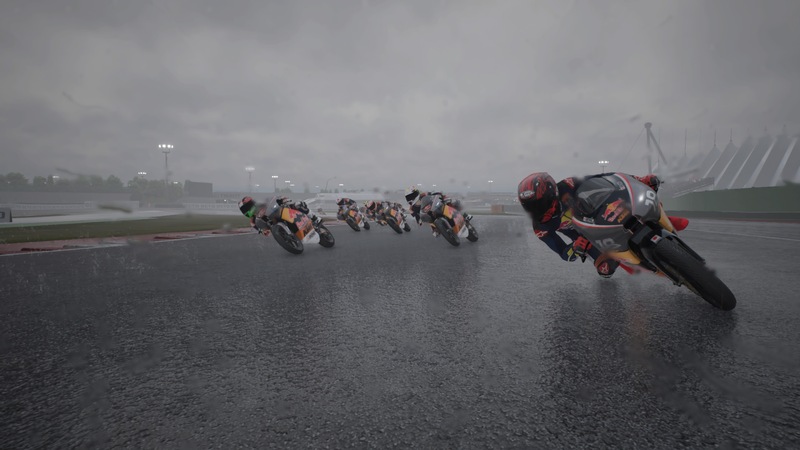 MotoGP 18 has the chance to change that, being the first in the series on Unreal Engine 4. Have Milestone made the necessary changes or is this just another case of stuck in the mud? Let’s find out. The move to Unreal 4 has improved Milestone’s output to a high level. That much is certain. It was noticeable with both Gravel and Monster Energy Supercross. However, this was looking at two brand new titles, though it could be argued that Supercross was more an extension of MXGP. Not that this is stopping Milestone from releasing MXGP Pro later this month. What about a direct comparison from one entry of a series to the next? MotoGP 18 certainly shines here. However, shining against something that could be best described as “a stopgap at best” isn’t something to be proud of. Maybe this is giving too much away at the start, but MotoGP 18 had so much potential with the move to Unreal Engine 4. One thing, in particular, has made great use of the change of engines. There are a few very small improvements dotted around elsewhere. Everything else may as well have been copy-pasted wholesale. Let’s start with the good. 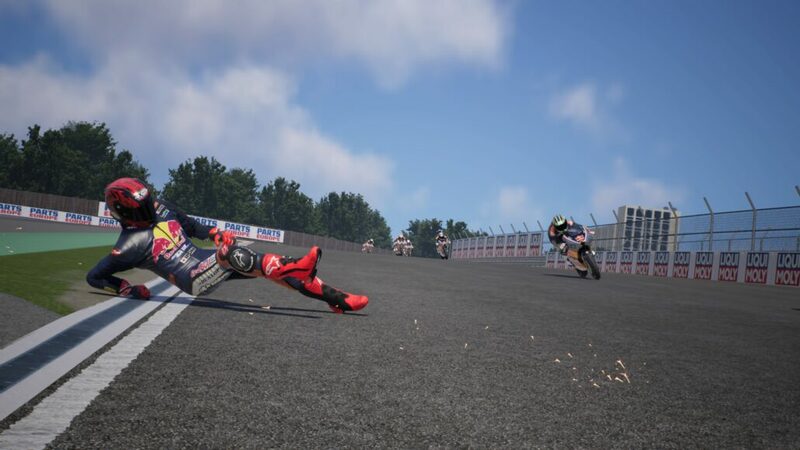 MotoGP actually looks like a modern game now. The scenery has some life to it now. Tracks have actual foliage, no longer flat surfaces with the rare lone shrub stuck up like it’s the last bastion of life in a desert wasteland. As small as this may seem, there’s something that feels wrong about a racing game which feels lifeless. Everything in MotoGP, with one exception, has that feeling of being an actual track on race day. From the bustle before the race to the cheer of the crowd, it’s something you can actually immerse yourself in. That one exception I mentioned is the track itself. There are a few texture pop-ins here and there. Also, It’s strange that other games, including Milestone’s earlier mentioned titles, have been able to make dynamic changes to the tracks as you race. Here, however, all of the skid marks are in place already. Heavy rain doesn’t pool up in certain areas of the track. Simply put, what you do has zero impact on the track itself. It’s a small, but niggling misstep by the game. At least the weather has an impact and looks pretty impressive. With the physics at least you’ve found something that has taken a step forward. A slight, tentative step, but nevertheless a step forward. As said, the weather has more of an impact than ever before. A lovely rainy day will make the track a lot less grippy, you’ll need to be a lot more careful or you’ll easily find yourself going off track. Even the time of day makes an impact, albeit less noticeable, with tyre wear being impacted. It’s here, and with the bikes in general, that Milestone has made a further leap. As before, all of the bikes look and handle differently to one another. Even those in the same class will have those slight differences that can lead you to a preference. Jumping from one class to another is a world of difference, as it should be. It helps that the bikes have been recreated with a huge amount of detail and you can also make your own slight changes to the settings. Bringing back a slight niggle from the previous title are the riders themselves. As before, you have a slight range of leaning styles that each rider is set to. This hasn’t really changed from the previous game and it still has the issue of every single rider being a clone. Height and weight differences are seemingly non-existent in Milestone’s view of MotoGP. Hell, even moving doesn’t seem to be a factor. The riders are still statuesque, even under the force of a collision. Sadly, another major jump to the side is the AI. It’s a complaint I’ve had before and I still have now. All too often you’ll see computer-controlled riders sticking to the optimal line so rigidly it’s like a fetish. It doesn’t matter if you, another rider or a rampaging donkey is in the way, they’re taking that path. I’ve been knocked off and I’ve seen others get knocked off at this failing from the AI. It’s something other series managed to solve last gen, seeing it now is a major disappointment. One thing that can be said is the flaws of the AI is slightly mitigated when the game is played on the harder difficulties. Only slightly. The saving grace will be the ability to play online. Humans are at least a little more likely to take evasive action if the line they wanted suddenly has a solid object in the way. It does help that you’ll be racing for the chance to win a BMW M240i Coupé. Not a slight on the game, but this makes little sense to me. Why offer a car worth £38.5k in a motorbike game when you could offer up three BMW R 1200 R’s? 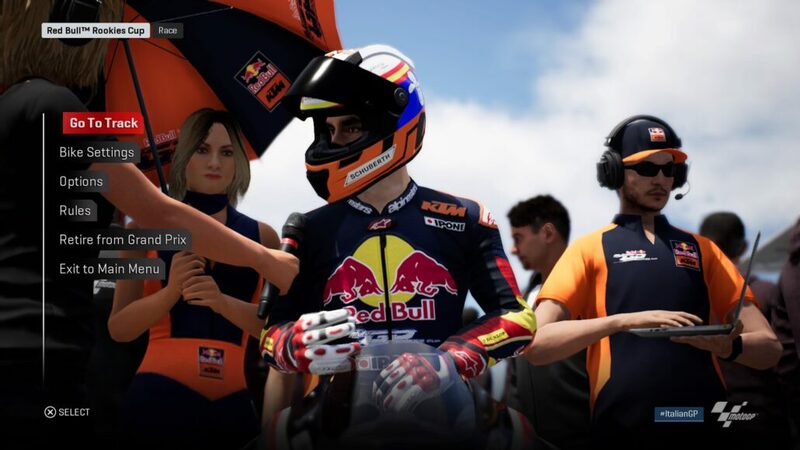 It’s certain game modes that can propel MotoGP 18 forward. You’ll likely not find yourself overly attached to the regular game modes. Be this jumping into a single race or a time trial. Much like the previous release, it’s the career mode that will give you something to sink your teeth in. As you advance through the ranks you’ll gain experience to fine tune and tweak your bike to your own particular specifications. Considering everything, do I recommend MotoGP 18? If you want a motorbike racing game now, then go for it. I wouldn’t be surprised if Ride 3 ended up being a lot better. It’s an improvement on the previous iteration, even if only visually. Aside from that, it feels like the same game but ever so slightly improved. That’s the real shame, the jump from Milestone’s aging engine to Unreal had a lot of potential. All I can hope is that with this being the first MotoGP using Unreal, Milestone will be able to build up and really improve for the next iteration. PS4 version reviewed. Copy provided by publisher. It's an improvement on the previous iteration, even if only visually. Aside from that, it feels like the same game but ever so slightly improved. That's the real shame, the jump from Milestone's ageing engine to Unreal had a lot of potential. Considering everything, do I recommend MotoGP 18? If you want a motorbike racing game now, then go for it. If not, you may be better waiting for Ride 3.